According to 7 Action News in Detroit, on Wednesday legendary pastor Marvin Winans was assaulted and his vehicle stolen by a carjacking gang. On Thursday police arrested two people in the incident and recovered the vehicle. Winans was pumping gas Wednesday afternoon at a Detroit Citgo station on the corner of Linwood and Davison when at least two men ambushed him. 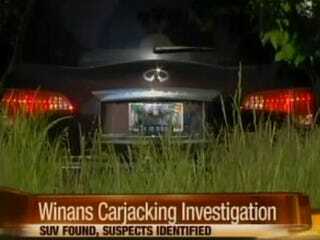 The carjackers took his deep purple Infiniti QX56 SUV, a couple hundred dollars in cash and his watch. The legendary pastor is well known in Detroit and for his family's gospel music. Winans recently gained attention when he gave the eulogy at Whitney Houston's funeral . He told 7 Action News that he did not believe his attackers recognized him. Pastor Winans said he felt something was wrong when he came out of the gas station's convenience store. He said several men followed him out and assaulted him while he was pumping gas. They robbed him, punched him and even ripped off his pants. Pastor Winans says he's OK, but is more saddened that it has come to this. “This kind of nonsense just has to stop," he said Wednesday afternoon. "It’s just the savageness of what’s happening in the streets. We just have to take a look at ourselves and say this has to stop,” said Pastor Winans. Read more at 7 Action News.